The holiday season has officially begun in the Tampa Bay area! I have been researching fun family activities to celebrate Christmas, and I was thrilled to find Christmas Lane in Plant City. Christmas Lane is an amazing winter wonderland light display with something for everyone to enjoy! We had the pleasure of visiting and I am excited to share our experience with you. When we entered the Charlie Grimes Family Agricultural Center at the Florida Strawberry Festival® grounds, we were greeted by a massive, beautiful display of over 1.5 million lights and life-sized decorations. 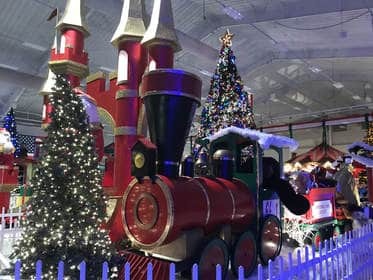 From trees to trains, Christmas Lane has it all! There were even characters such as a gingerbread man and Rudolph walking around to pose for pictures with the guests! Our first stop was to see Santa and Mrs. Claus. It was a perfect way to start our visit to get us in the Christmas mood. They have a beautiful display with fun props to use, just like a photo booth! They took amazing photos for us and we were able to buy them right there. You can also use your own camera to capture the visit. My boys next wanted to check out the carnival rides. They had about 7-8 carnival attractions, and be advised – there are height restrictions. My older two boys had a blast riding and never had to wait in line (we visited on a Thursday evening). My 18 month old enjoyed the carousel ride the most! I was worried at this point that we wouldn’t have much more to do before the Living Nativity started, but wow, was I wrong! We made our way over to the other side of the complex where we enjoyed face painting, ornament decorating, and letters to Santa! We indulged in some popcorn and I was impressed with the affordability of all of the snacks. This area of Christmas Lane included the stage where they have nightly performers. We were mesmerized by the performer on a unicycle! After the stage performance, we enjoyed the Living Nativity outside. The boys loved seeing the animals and the live angel who performed. My favorite part was the live performance of “O Holy Night” and “Silent Night.” The Living Nativity is presented by local churches every Thursday and Saturday of the season. Christmas Lane was the perfect way for us to kick off the holiday season. It was fun for our entire family! Where: On the grounds of the Florida Strawberry Festival® inside and around the Charlie Grimes Family Agriculture Center at 2508 West Oak Avenue, Plant City, FL 33563. Sunday from 6 p.m. to 10 p.m. each night. night. Every child who wears his/her league jersey or shirt will receive free popcorn. Sundays will be Senior night and all Seniors will receive a complimentary cup of coffee. Parking is free and can be accessed from Lemon St. and Oak St.